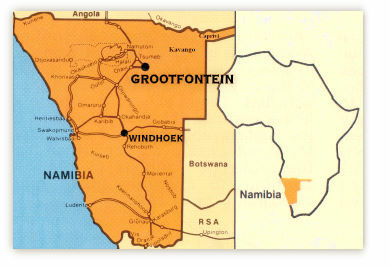 Our museum is situated in Grootfontein in northern Namibia. If you arrive in Grootfontein from Otavi or Tsumeb, drive for 2.1 km through Grootfontein passing Meteor Hotel and Spar supermarkett. Right in front of the Total petrol station turn left into Erikssonsteet and then left at the next possibility up the hill to our old fort. If you arrive in Grootfontein from Rundu and the Caprivi, turn right right after the Total petrol station into Erikssonsteet ab nd then left at the next possibility up the hill to our old fort.